Thank you for taking this moment to allow us to introduce ourselves. We are Jimenez Custom Painting Inc. Ca. Lic. #793594, a family owned and operated business with 20 years experience in the painting and wood finishing field. Our 4,000 sq. ft. cabinet, millwork and furniture finishing facility is conveniently located in the heart of Van Nuys, Ca. We specialize in the high end custom residential painting, wood finishing, Venetian plasters and faux finishing. We are proud to say that we have participated in hundreds of projects throughout Los Angeles and the neighboring counties that have required nothing short of superior quality workmanship. The references listed on the attached pages are a small sample of the builders, designers and homeowners who have entrusted us to contribute in the improvement and beautification of their remodeling and new construction projects. In addition we included several photographs of recently completed projects. We are skilled and accomplished in quality cabinet finishing, furniture grade staining, distressing, antiquing, specialized interior and exterior wall treatments, faux finishes, wood graining, marbling, gilding, glazing, verdigris, Venetian and decorative plasters, lacquering, custom enameling and color matching. There are four family members including myself, directly involved in the field supervising and working side by side with our crews. We are responsible, experienced, hardworking, clean, and polite. We are team players who work well with all trades to assure trouble free completion of the task at hand. We are fully equipped and staffed to take on any size project or projects whether it is a piece of furniture, kitchen remodel or a 35,000 Sq. Ft. estate. We will provide certificates of liability insurance, worker's compensation and auto policies upon request. 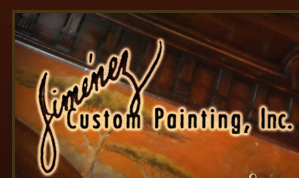 Jimenez Custom Painting Inc. is a member of the P.D.C.A. and The Society of Gilders. Our firm is listed in the Los Angeles first and second edition of The Franklin Report page 295. At this time we politely request the opportunity to submit proposals for the painting and wood finishing part of your project or projects.